Our classroom is set up like an actual bar. 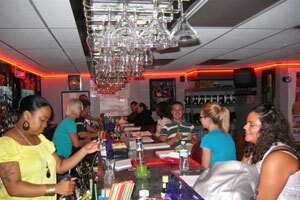 Our students sit at the bar and watch our instructors make each and every drink right in front of them. The class is divided between 25% lecture time and 75% practice time. Once the lecture/demonstration is over, the students get behind the bar and make each and every drink. Class time also includes role playing and simulated happy hours to work on the student's speed and efficiency. 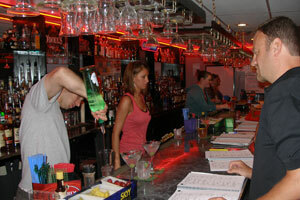 Our 40 hour Professional Mixology course consists of ten 4-hour lessons. Each lesson is an independent module that can be taken in any order after the first class and orientation. We now offer morning, afternoon, night and weekend classes to fit any schedule. In addition, we have the option of tailoring a flexible schedule using any combination of day, evening, weekend or special times to fit any students situation. The accelerated class option allows the student to take our standard 40-hour course in one week. The student takes two, 4-hour classes each day for 5 days. The accelerated class is held Monday through Friday from 9am to 5pm one week monthly. Our 40 hour professional mixology course consists of 10, 4-hour lessons. Each lesson is an independent module that can be taken in any order after the first class and orientation. The student may take any combination of day, evening or weekend classes until they complete the ten, 4-hour lessons required to graduate. The classes may be taken in any order after the first day. Every Saturday from 10:00am to 6:00pm Five weeks in length. New classes start each week. Monday through Friday from 6:00pm to 10:00pm, Two weeks in length. Monday through Friday from 9:00am to 5:00pm, One week in length.